I can’t believe it’s that time of the year already when we all start thinking about Christmas shopping. My good friend and fellow artist Charlene Brown and I have joined forces this year and are putting on a Christmas sale at Charlene’s studio. 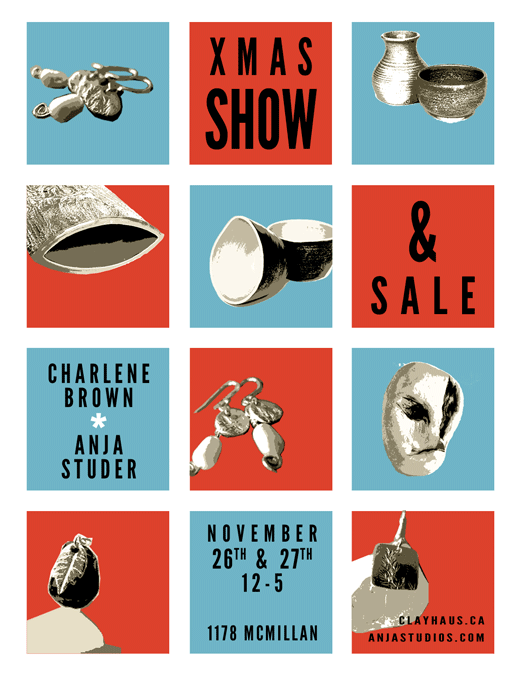 Please come visit us….drink some coffee….do a little shopping (pottery, jewelry, photography and textiles)….Nov 26 & 27, 12-5p, 1178 McMillan. This weekend is the studio tour “In Plain View” again. It’s a great opportunity to get a peek inside lots of Winnipeg based artists’ studios and see their work. Enjoy the great whether this weekend and take part of this self guided studio tour. For a complete list of participating artists visit www.inplainviewwinnipeg.com. Please make sure to add cre8ery to your list of studios to visit. It’s a great opportunity to see lots of different artists’ studios in one convenient location. Come and visit us at cre8ery, 2nd floor – 125 Adelaide between noon and 5:00 p.m. this Saturday and Sunday and check out some of my jewelry, bags, photography and paintings. Enjoy the tour and I hope to see you this week-end! Just a reminder that this week-end is the studio tour “In Plain View”. If you would like to take the self guided studio tour please check out the list of participating artists at http://www.inplainviewwinnipeg.com. I am one of the artists participating and you can come by my studio at cre8ery, 2nd floor – 125 Adelaide between noon and 5:00 p.m. this Saturday and Sunday. Come by to check out some of my jewelry, bags, photography and paintings. Enjoy the tour and I hope to see you this week-end!